Nauvoo (population 1,063) is located on Illinois Route 96 in upper-western Illinois. The town is located on the banks of the Mississippi River in far western Hancock County. Nauvoo is located about 35 miles west of Macomb. The town was platted in 1835 and originally named Commerce. In 1839 Joseph Smith and the Latter Day Saints moved into town and set off a population explosion. The town was renamed Nauvoo (which literally means "beautiful location") and quickly spread its wings. Colusa (estimated population 25) is located in upper-far-western Illinois about 25 miles northwest of Macomb. This little hamlet is located in the north-central area of Hancock County. According to Map Quest (www.mapquest.com) Colusa is about two blocks long from north to south and one block wide from the east to the west. Colusa is situated on County Roadway 1750 between roadways 2500 and 2600. The nearest well-traveled roadway might be Illinois Route 94 located 1 1/2 miles to the east of Colusa. Colusa has a distinction of being both ten miles east of the Mississppi River and four miles south of the Mississippi River. Branches of the Camp Creek flow to the west and east of town. An unnamed set of railroad tracks runs through town as well. Both towns supported their own high schools on a solo basis for several years. It was in 1961 that the residents agreed to pool their educational resources and merge the two school districts. The new district created by the merger of Nauvoo High School and Colusa High School was aptly named Nauvoo-Colusa High School. The high school was located in Nauvoo. This arrangement worked well for the next 47 years. Dwindling enrollment and financial strife began to take their toll. 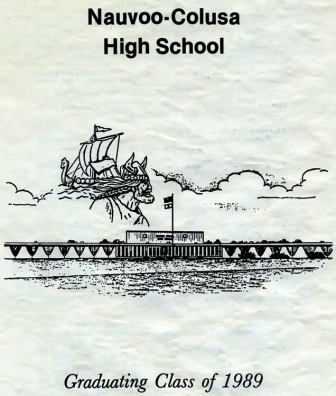 It was decided in 2007 that the final school year for Nauvoo-Colusa High School would be the 2007-08 year. At that point Nauvoo-Colusa High School was deactivated with all students now attending high school in nearby Warsaw. 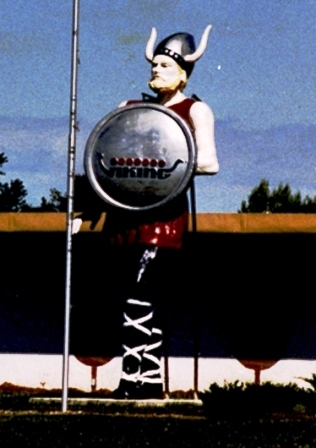 NCHS team nickname: the "Vikings"
Many successful seasons followed in various sports after the Nauvoo and Colusa boys and girls joined forces in high school sports. By far the most successful season was the STATE CHAMPIONSHIP won in boys basketball during the 1997-98 season!! All totalled the Vikings and Lady Vikings brought home 9 Regional titles, 1 Sectional title, 1 Super-Sectional title, and a State Championship during their 47 years of existence. We are searching for the school fight song, team uniform colors, and several season records/coach's names. Playing in a "hot bed" of basketball the Nauvoo-Colusa HS boys basketball program held their own and then some. A total of 5 Regional Championships were won by the boys. As mentioned above, one magical season took the team all the way to the Class 'A' State Championship. Coach Reno Pinkston had a great run with the Vikings, winning 201 games and losing only 65 in one eight year stretch. Coach Pinkston was also the head coach of the State Champs. All of the information listed below was located on the IHSA website, www.ihsa.org . Scores involving Nauvoo-Colusa High School in the IHSA Tournament were located on a website titled "Illinois Postseason Basketball Scores." These scores are also printed below. 1965-66 Postseason scores, record, and coach's name needed. Warsaw lost in semi-final round. 1975-76 Postseason scores, record, and coach's name needed. 1976-77 Postseason scores, record, and coach's name needed. Pittsfield lost in Sweet 16 round. 2004-05 Postseason scores, record, and coach's name needed. Macomb lost in Elite 8 Round. 2006-07 Postseason scores, record, and coach's name needed. 2007-08 Postseason scores, record, and coach's name needed. The Lady Vikings also had some nice seasons. Only two are listed on the IHSA website. One Regional title highlighted the program's successes. Several season records and coach's names are needed. 1973-74 through 2001-02 Postseason scores, records, and coaches' names needed. 2002-03 23 - 9 Postseason scores & coach's name needed. CPC lost in title game. 2004-05 Postseason scores, record, & coach's name needed. 2005-06 Postseason scores, record, & coach's name needed. 2006-07 Postseason scores, record, & coach's name needed. 2007-08 Postseason scores, record, & coach's name needed. The harriers of Nauvoo-Colusa High School qualified for the IHSA State Meet in the 1977-78 season. Unfortunately this is the extent of the information we have regarding the boys cross-country program. 1977-78 Team Qualified for the IHSA State Meet!! The lady harriers had one runner place at the IHSA State Meet. Kortney Ellingboe was a top-ten finisher in 2005 and followed that effort with a top-twenty finish in 2006! 2005-06 Individual Medalist Kortney Ellingboe 9TH Place!! 2006-07 Individual Medalist Kortney Ellingboe 18TH Place!! Back to back Regional Championships brought a great ending to the boys baseball program at N-CHS. Team records and coach's names are needed for these and other great seasons. The girls won a Regional Championship in softball during the 2001-02 season. Information is requested regarding this and other great seasons on the softball diamond. The IHSA website only lists five seasons from the mid-1980s. We are certain there are many others. Please contact us if you have further information regarding the lady netters of Nauvoo-Colusa High School. We are certain that sports were not the only thing offered at Nauvoo-Colusa High School. Plays, band, chorus, student government, and clubs were likely all a part of the NCHS experience. If you have information regarding these activities please send it to us for inclusion on this page.